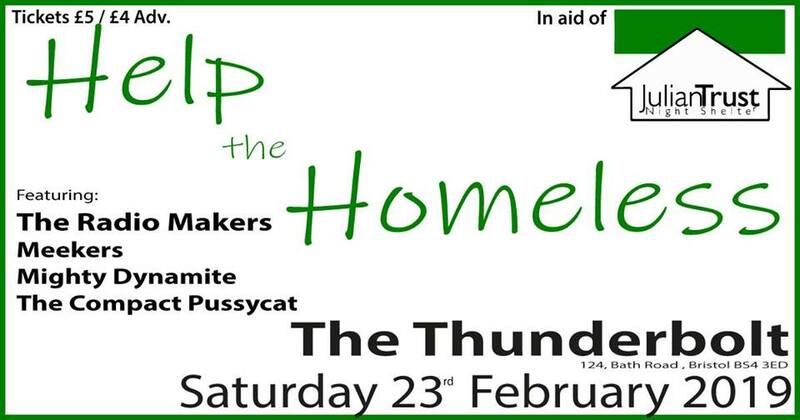 THE RADIO MAKERS + Meekers + Mighty Dynamite + The Compact Pussycat " Benefit gig to raise funds for the St Julian Trust Night shelter"
THE RADIO MAKERS are headlining a 4 band gig on Saturday 23rd February 2019 at THE THUNDERBOLT in Bristol, in aid of The Julian Trust, which runs an emergency night shelter located in the centre of Bristol for homeless people and rough sleepers (www.juliantrust.org.uk). We are happy to announce the full line-up is now confirmed as The Radio Makers, Meekers, The Compact Pussycat and Mighty Dynamite. Come along to witness some of the finest pop/rock/glam/punk/indie music in the South West and support this worthy cause at the same time. Tickets are £4 in advance, £5 on the door. Doors open at 7.30pm. A hard hitting alternative glam-pop quartet, who deliver a catchy brand of 'in your face' guitar-driven power-pop. A fresh faced indie rock trio that deliver hot rhythms & melodies that stick in your brain like bubblegum. This mixed with unapologetically melancomedic lyrics make this outfit one to wear everyday. An energy fuelled explosion of garage rock and good times. Their sideways look at life, love and escape gets feet dancing and faces smiling.